So another week has come to an end or you can say it’s the start of another one. 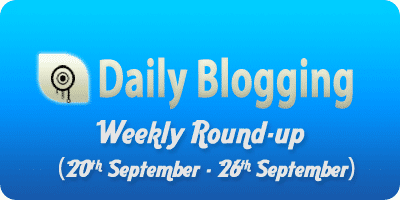 This past week was very delightful for me, as DailyBlogging entered the Elite Alexa Club. Now our Alexa rank stands at 95,416. You can check our current rank by navigating to our Alexa page. It’s improving day by day & I’m very happy with that. Special thanks to all the readers, sharers & commentators. Without you guys we would be nothing. Also, one important point to note is visitors have started liking our content. This resulted in an increased subscription rate. So if you are new & haven’t subscribed yet then Do subscribe to Our RSS Feeds/Daily Updates (via E-mail). 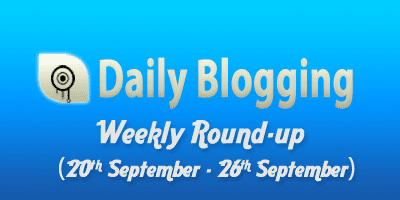 You can also read our previous weeks roundup. As said earlier this week I will be rolling out the Guest Posting Structure. For more info about it you can ‘Like’ DailyBlogging’s Facebook fanpage or follow me on twitter @tospost. Next PostIs Google celebrating its 12th Birthday today ? my blog techtoom.com also raised from 9,988,429 start of this month to 296,142 today.